Horizon has made some big schedule changes this past week, and it shows they’re in a corner, trying to figure out what to do to make things work. I don’t think this is a big story, but I was quoted regarding the mechanics of overbooking. Here’s a fun, controversial one. It’s mostly tongue-in-cheek, but the way things are going, the airlines should think about this one. I like what Virgin America is doing here to target social media influencers. Smart move. If you’d like to know the Tweet that I talk about not responding to, it’s right here. You can also see part of the panel discussion with Benet Wilson and Mary Kirby here. Every time Spirit launches a tacky sale, they’re counting on the media to pick it up and give them free ads. They do, every time. Bloomberg has picked up the Virgin Atlantic ground delay story, and they asked me to comment. I loved he last line in your BNET article on Spirit’s media presence. Just out of curiosity, does BNET ever give you any flack for being a bit liberal with your sense of humor? Nope, they are quite supportive. In fact, they review every post before it goes live these days, and they’ve never said a word about there being a problem. I was bumped going through Denver this week on my return to LHR from SAN – United were very generous, actually – C-class on the next day’s flight and $600 in vouchers. 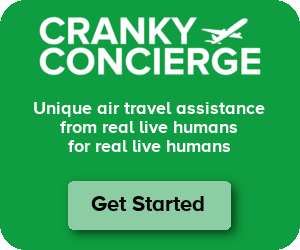 Cranky, I usually agree with you but allowing airlines to hold people hostage on a hot plane with no air conditioning is crazy. Regulation will not magically fix the problem, but it will encourage the airlines to try harder to fix this problem. Immigration was not even notified of the problem for two and 1/2 hours after the flight landed and BDL has customs facilities and secure areas. A plan to allow passengers off the plane into a secured area could have been worked out with the help of TSA. Other options were to divert to an airport with the ability to handle international passengers at night. I know nay sayers will respond to my arguments by saying, “its not as easy as you think.” That may be true, but that doesn’t mean we can’t come up with different ways of doing things to avoid situations like this. We are a resourceful people, just because something is hard doesn’t mean we shouldn’t do it. You say that they could have worked with the TSA to get people off the plane, but it’s not TSA. It’s CBP (customs and border protection). And there are conflicting reports about what happened there. Virgin Atlantic says that the pilot was told passengers would be arrested if they were let off the plane. CBP says that never happened. I tend to believe Virgin, but hopefully tapes will be available that will show what really happened. I think it is a question of individual rights. Keeping people imprisoned in a metal tube without air conditioning should not be “against regulations”, it should be unlawful imprisonment. The passengers forced to endure such an ordeal should have the right to sue the airline. The “more flights will be cancelled” scare can be fixed by European-style regulation: if flights are cancelled, stranded passengers have the right to accomodation and food reimbursements, even if the cancellation is due to weather (ultimately, bad weather is part of the risk airlines take while operating). So penalties for cancelling flights for airlines would eb heavy, and cmpetition would avoid excessive ticket price increases, European ticket prices, with much heavier regulation, is below US prices, with a higher service quality. European-style regulation comes with its own set of issues. If you force additional cost on the airlines, then you’re putting safety at risk by pushing them to fly when it might not be the best plan. That being said, there is no way this wouldn’t increase fares. Costs go up, fares have to go up or flights have to disappear. It’s sadly quite simple in that respect. I’m not sure how you’re measuring ticket prices in the EU being lower than the US, but please send those numbers over here. With AS adding more Hawaii service from Oakland and San Jose, you would almost think they would use Horizon to add service to small cities for some connecting traffic.